King Arthur Flour sends out email blasts that highlight specials, new products, and recipes. Recently, one landed in my inbox with a recipe for Six Grain Bread, which captured my interest. Like many bakers, I have assorted seeds, grains, etc., stashed away to use in my baking. 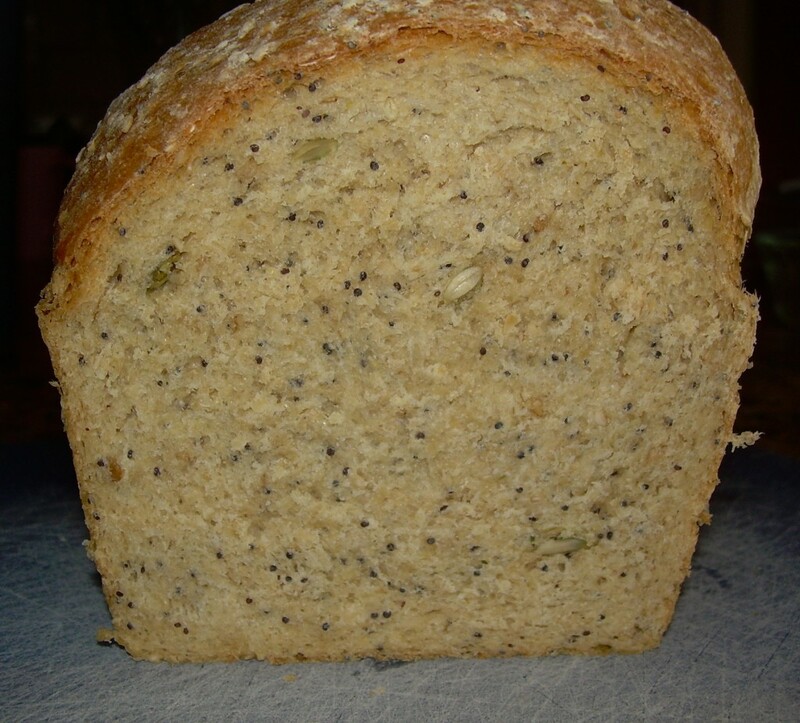 While I didn’t have their Harvest Grain blend on hand, I did have poppy seeds, pumpkin seeds, sesame seeds, and oat bran, all of which I used instead of the blend. The result? A flavorful, easy to slice bread that made good sandwiches and even better toast. Master Chow, my Honorable Husband, asked me to put it on the repeat list. Even though the flavor was very good, next time I am going to retard rising by storing the dough in the refrigerator overnight to see how that changes the flavor profile. And be sure to check out Susan’s weekly YeastSpotting round up of breads baked all around the world. 1) Combine all the ingredients in a large bowl. Mix and knead by hand or stand mixer until the dough is smooth and supple, adding additional liquid or all-purpose flour as needed. I recommend that you leave the dough slightly sticky – as it rises, the stickiness will diminish and in the end you will have a moister and more tender loaf. 2) Place the dough in a lightly greased bowl, cover, and let it rise for about 1 hour. 3) Turn the dough onto a lightly oiled work surface, and shape it into a 9″ log. 4) Place the loaf in a lightly greased 9″ x 5″ pan, cover the pan, and let the loaf rise about 40 to 60 minutes, or until it’s crowned about 1″ over the rim of the pan. Towards the end of the rising time, preheat the oven to 350°F. 5) Bake the bread for 30 to 40 minutes, or until it’s golden brown and its internal temperature registers 190°F on an instant-read thermometer. 6) Remove the bread from the oven, remove it from the pan, and allow it to cool on a rack.